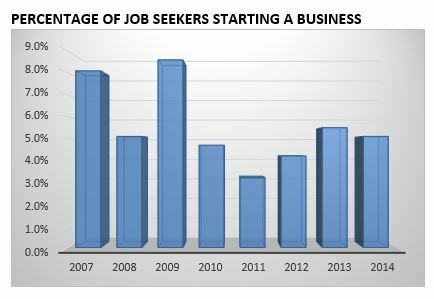 Job Seekers Say "NO" to Start-Ups | Challenger, Gray & Christmas, Inc. Despite an improving economy and better conditions for starting a business, a new survey shows that the majority of job seekers still consider entrepreneurship too risky and gravitate toward traditional employment opportunities. On average, just 5.1 percent of unemployed managers and executives started their own business in 2014, according to a quarterly survey of job seekers who found a position, pursued self-employment, or retired. The 2014 start-up rate was down slightly from 2013, when it averaged 5.5 percent per quarter. However, both 2013 and 2014 rates were significantly better than the two previous years, when start-up activity average 4.2 percent in 2012 and 3.2 percent in 2011. “We saw a surge in start-up activity in 2009, but as it became clear that this would be a slow recovery, interest in starting a business fell to historic lows,” said John A. Challenger, chief executive officer Challenger, Gray & Christmas. “Now that the economy is finally hitting its stride, one might expect a surge in start-ups. While the percentage of unemployed managers and executives starting businesses has, in fact, increased, the survey results suggest that the severity of the recession had an adverse impact on would-be entrepreneurs, who appear to be far more sensitive to risk,” he added. The latest data from the Bureau of Labor Statistics also indicates a decline in self-employment. In 2104, there were approximately 8.6 million unincorporated self-employed workers in nonagricultural industries, or about 6.0 percent of the 144.1 million nonagricultural workers in the US. That is down from 6.5 percent in 2009. The number of self-employed workers who have incorporated their businesses has stayed relatively stagnate over the last decade. As of 2014, there were 5,236,000 incorporated self-employed workers in nonagricultural industries, up slightly from 5,150,000 in 2013. Both years are down from a pre-recession peak of 5.6 million in 2007. “In addition to increased aversion to risk, start-up activity is undoubtedly being stunted by the growing availability of traditional employment opportunities. The number of metropolitan areas with low unemployment continues to expand. In these markets, where the labor pool is getting shallower by the month, the incentives being offered by employers may be luring people away from self-employment,” said Challenger. According to the latest data from the Bureau of Labor Statistics, there were 158 metropolitan areas with unemployment below 5.0 percent in December of 2014. There were 67 metro areas with an unemployment rate below 4.0 percent.